Turmeric root is packed with beneficial compounds, especially curcumin, that work together to support the body’s antioxidant processes. 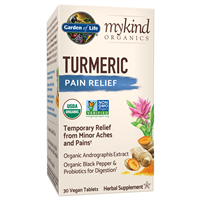 Our Turmeric Pain Relief includes Certified USDA Organic and Non-GMO Project Verified fermented turmeric root and extract and features clinically studied andrographis extract (Paractin®), which supports the body’s reaction to occasional pain. Our Price: $34.99 Save 5% in your cart! Our Price: $45.00 Free Shipping Item! Our Price: $25.00 Free Shipping Item! © Copyright 2015 Apple A Day & Beyond DBA Golden Apple Organics. All Rights Reserved.